M.G. Bn., Australian Infantry. 13 September 1944. Age 36. Son of Walter George and Margaret Rebecca Nicholson, of Mount Hawthorn, Western Australia. Panel 19. Please read of other Wyalkatchem men who died. 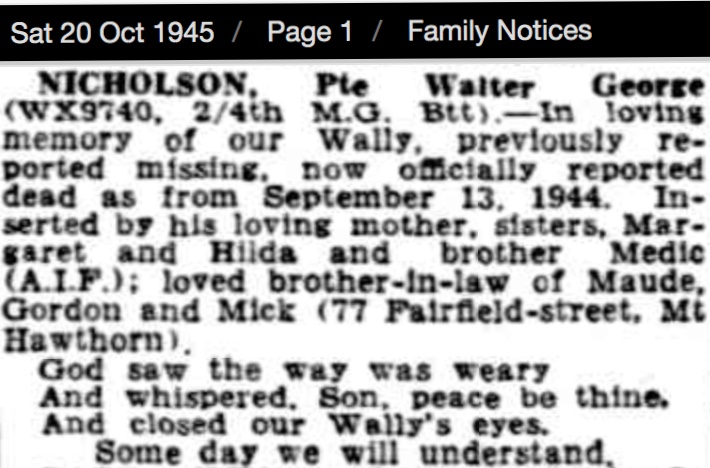 We are unable to confirm the year the Nicholson family arrived in WA from England, however we do know Wally’s father died in 1916 in France. Walter George Nicholson (Snr) enlisted Australian Infantry WW1 on 9 September 1914 with 13th reinforcements, 11th Battalion. His service No. was 210. He gave his previous occupation as Greengrocer. He was sent overseas however returned 17 July 1915 medically unfit. The reason: Deafness. Nicholson returned to Duty at 5 MD 30 November 1915 – and was soon sent overseas to serve in France. 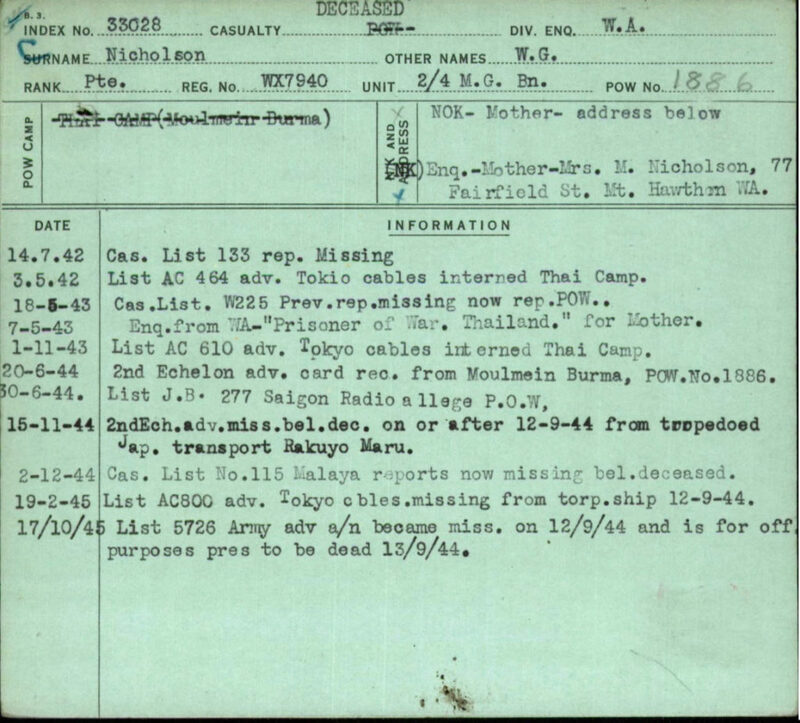 On 25 May 1916 he was fatally wounded – GSW to abdomen and died later that day. He was buried in a Communal Cemetery at Estares, France. 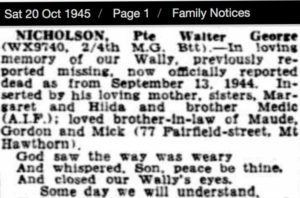 His son Wally (Jnr) was 9 years old. Margaret Nicholson gave birth to her youngest daughter Hilda in August 1916. Hilda was her third daughter and she had four sons. Unfortunately we have no knowledge of Wally’s life except that he was working as a farmhand at Yorkrakine, which is 30kms north east of Tammin. At that time there would have been a district hall, possibly a general store and/or other community facilities. Wally’s mother Margaret Nicholson died 1971 at Mt Hawthorn aged 86 years and was buried Karrakatta. As a POW in Singapore, Wally was selected with ‘A’ Force Burma Green force No, 3 Battalion to work on the Burma end of the Thai-Burma Railway. This was the first many work parties to leave Singapore and 3,000 POWs sailed from Singapore on 14 May 1942 for the south west coast of Burma, where Green Force would work on repairing and improving the aerodrome for several months before making their way to the northern tip of to-be-built rail link. They were the first party of Australians to commence working on the railway, at Kendau 4.8 km Camp on 1 October 1942. They would finally finish at the end of December 1943. Following completion of the railway by end of 1943 the Japanese brought all the POWs in Burma south into one of several large camps and/or hospitals. Whilst at Tamarkan Wally was selected with a large number of Green Force POWs as being fit and to work in Japan. They were trained to French Indo-China via Bangkok. They were planed to sail from the port near Saigon. They were accommodated in Saigon and worked mosty around the docks. Several attempts were made to load what wasnto become known as ‘Rakuyo Maru’ group onto a ship – but finally the Japanese realised it would be futile, the American submarines had successfully established a very effective blockade. There were sunken transport ships lying in and around the waters from the coast to Saigon. ‘Rakuyo Maru’ group were sent by train to Singapore via Bangkok. By this time Allied bombing was targeting Bangkok and other important rail heads and stations. The men were relieved to be back in Singapore where they were housed at River Valley Road Transit Camp. Whilst they waited for a ship, the men worked at the docks and nearby it was now early September 1944. On 12 September ‘Rakuyo Maru’ was sinking in the South China Sea from an American submarine torpedo hit. Only a few POWs survived. Tragically Wally Nicholson succumbed to the terrible conditions the men were enduring – no water, food and no rescuers. He was 36 years of age.